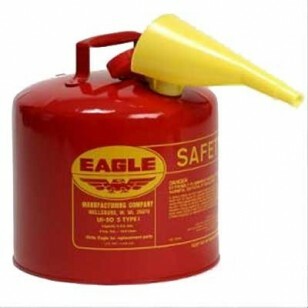 This is the largest of our Eagle Safety Cans holding up to 5 gallons for safely carrying and storing gasoline and flammable liquids. This size is our most popular among all of our safety cans. Eagle Safety Cans have a non-sparking brass spout with flame arrestor and a spring-loaded closing lid. The safety cans are constructed from 24-gauge galvanized steel and have a powder coated paint finish for added durability. Optional ABS plastic funnel available for easier dispensing.